Flying Foxes Pink batts aren't the only bats that will be preying on Peter Garrett's mind at the moment. 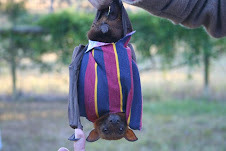 Of the many native species the Minister has responsibility for in his environment portfolio, probably none cause as much public and political controversy as flying-foxes -- that is, fruit bats. Within the next two months, the Minister will have to make a decision on whether to approve the proposal by Botanic Gardens Trust to disperse, by means of noise harassment, the colony of grey-headed flying-foxes from Royal Botanic Gardens Sydney. There will be immense political pressure on the Minister to approve the action. The gardens are within the NSW environment portfolio and, to date, the state bureaucracy has done everything it can to ensure the dispersal goes ahead. All that stands between the Botanic Gardens Trust and some bat harassing is Commonwealth approval. But to approve the dispersal, currently the subject of a referral under the Commonwealth Environment Protection and Biodiversity Conservation Act, the Minister will have to place a higher value on the preservation of exotic plant exhibits in the gardens than on the protection of a federally listed threatened species. There is a body of evidence that shows that dispersals generally don't work and are likely to have serious implications for the bats' welfare and breeding success. Problematically for him, the Minister's own department recently listed for public comment the Draft National Recovery Plan for the grey-headed flying fox. This draft, endorsed by the NSW Department of Environment, Climate Change and Water (of which Botanic Gardens Trust is a part), contains criteria that will be used to determine whether habitat should be classified as critical for the survival of the species. The Royal Botanic Gardens Sydney meets every single one of the criteria. Loss of such habitat is highlighted as being a high priority threat to the recovery of the species. Approving a dispersal would be akin to dismantling a policy before the ink is even dry on the signatures. Approving the Royal Botanic Gardens dispersal will inevitably have a domino affect on those areas of conflict where residents feel that flying fox colonies are diminishing their quality of life but are being stonewalled when it comes to applications to disperse the bats. Maclean, on the mid-north coast of NSW, is a site of ongoing conflict; Singleton in the Hunter Valley is another with a long-term history of bat-related stress and it's only a matter of time before Kareela in Sydney's south and Bowraville on the mid-north coast turn into political problem areas because of flying-fox conflicts. The flying foxes that soar above Cairns each afternoon could ­become the city's newest tourist attraction. Dozens of tourists have been gathering near the Cairns Library each afternoon to watch hordes of bats flying away from nearby trees in search of food at dusk. For the past two weeks, the bats have been filling the sky at least three hours earlier than usual, creating an impressive sight in daytime. Tolga Bat Hospital co-ordinator Jenny Maclean believed the bats had become more active earlier because of the wet weather. "With all this wet weather, it’s very hard for them to get out and find food," Ms Maclean said. "If you’ve ever gone out on a motorbike without a visor in the rain, it’s very hard. Imagine if you were flying through rain. What it means is, they are hungrier than usual by 2pm and haven’t been able to get out as much the night before."